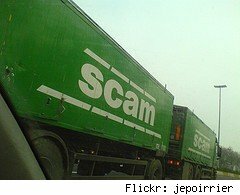 Economic stimulus scams have arrived! This weekend I read in our local paper about an individual who almost got caught up in a scam to drain her bank account. The scammer was using the upcoming economic stimulus package to solicit personal and bank account info under the guise of the IRS. Even though she had already provided the information she was lucky enough to change her bank account info before any funds were drained. The local IRS contact warned individuals that the IRS will not make contact via email and that scams like this are a common occurrence. WalletPop producer Amey Stone had warned of the tax rebate scams before congress had even approved the stimulus package, but as May 2 approaches, the frequency of attempted rip-offs will only increase. The IRS already spent $42 million letting citizens know that the checks are coming, and the only requirement is to fill out a 2007 tax return. Despite the Super Bowl-sized campaign and nonstop news coverage it seems individuals are still falling for these scams. I don't think I can put this any nicer, don't give out your personal information online! It is really that simple, if everyone stops answering these "demands" for banking info, the spammers and con artists will at the least have to move to a new medium. I understand that at times the emails appear to be legit now that the bad guys hired an English major to write them, but just delete it.If you are really concerned that the IRS is auditing you, withholding your rebate check or sleeping with your sister -- Call them. Same goes for banks, colleges, and any other entity trying to "confirm" some piece of personal information so that your account isn't shut down. When you do make the call, use the number on your membership card or local yellow pages, not the one in the email they sent you. Remember, only you can prevent identity theft, well that and the IRS fixing its vulnerable computers, but mostly you.